We have created designs for hundreds of clients. View the images below to see a brief glimpse of some of our recent creations. Then call us to talk over your particular ideas. I can now offer you a preview of the design we’ll create for you. With specialized computer design software we can create scale drawings. Our scale drawings help you visualize the design. Descriptions, color, and fabric choice can be included. In fact, your design can be superimposed on a digital photo of your current room! 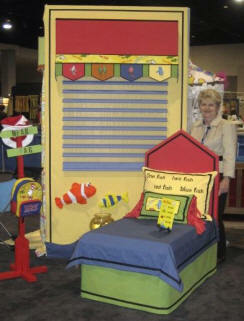 Deborah won honorable mention for her design of Dr. Seuss book entitled, ``One Fish, Two Fish, Red Fish, Blue Fish`` as announced in Draperies and Window Coverings magazine.